Making Dead Space 3's Co-op Good Was "Shockingly Difficult"
Steve Papoutsis, executive producer of Dead Space 3 really hopes you like the game's co-op. 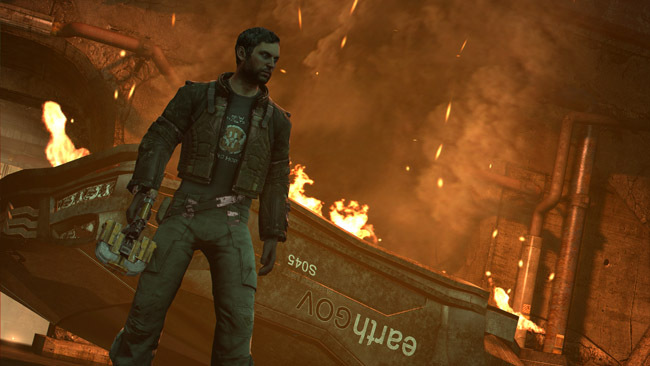 Part of that undoubtedly has to do with his belief that co-op is a great way for you to introduce a game to your friends, and given that EA claimed Dead Space 3 needed to sell "around five million copies for the franchise to be worth a continued investment, the more people talking about it, the better. Mostly, though, he hopes you like it because the team at Visceral worked really, really hard on it. "Let me tell you," he explains, "it was very difficult to create a game that allows for drop-in/drop-out, that's why you don't see it so much. It was shockingly difficult." The co-op in Dead Space 3 was about as gnarly a knot as it could possibly have been to create. First off, it's drop-in/drop-out, so the story needed to be flexible enough to adapt to whether it was just series hero Isaac Clarke in the scene or if tough guy John Carver was with him. Difficult enough, but then Papoutsis wanted the game's co-op to crush one of his own personal gaming pet peeves : the "good save." You know how it goes - you and your buddy are working through the game together, but he's player 1 and so the save lives on his machine. Then he never seems to want to play when you do, so either you have to wait for him, or start all over again from scratch. It's a common co-op frustration, but not one you'll face with Dead Space 3. Even if you were playing as Carver in co-op, you can resume the story as Isaac when tackling the campaign on your own.. Oh, and everything you collected in co-op you bring back with you into solo. A little, yes, because that solves another major pet peeve of co-op gaming (this one's mine): item allocation. Who gets the ammo clip? Who needs the health more? Annoying questions to have to constantly ask yourself, but even more annoying when you don't get the chance to ask them because your jerk of a co-op buddy swept through the room and grabbed all the loot while you were dissecting the necromorphs that were dropping from the ceiling. In Dead Space 3, no matter who opens the cabinet, box, or drawer, both players get an item. It might not always be the same exact thing - maybe you get health and I get material for weapon crafting - but we both get something, every single time. Making the systems work together, letting you drop in to someone's game "with all your goodies and come back with all your goodies," was immensely difficult but "critical" to making Dead Space 3 the "pre-eminent co-op experience," says Papoutsis. "We spent months of time figuring out how to make that work." It was an ambitious goal, and one that frequently seemed unreachable, but cramming co-op into Dead Space 3 was not, Papoutsis insists, a mandate from the suits at EA. "Are there things that seem to make games sell more? Yes, there are. But there's never been a point where the formula is A+B=C, go and do that. That does not happen. It's about what the creators want to do. EA is very supportive of the creatives." Besides, Visceral was thinking about co-op from the very beginning. "When we made Dead Space, believe it or not, there was a point very close to the end of development where we said, 'What would it be like if we had co-op?' and we turned on another Isaac and ran around the Ishimura." Trying to make it work would've thrown the game completely out of balance so late in its development, though, so the idea was scrapped. The multiplayer in Dead Space 2 made sense, says Paoutsis, because it fed off of that game's story, but for Dead Space 3, the team wanted to return to the franchise's "cornerstone" of story and characters, and that ruled out traditional multiplayer. And so we get a backstory for John Carver and Chapter Select and drop-in/drop-out and transferrable items and a whole lot of late nights for the creative team. "The team, a lot of those people were asking 'Why are we doing this? It's so hard!' Because our players will like it." Or at least he hopes they will. "The fact that we did what we [did] to me is amazing and I hope people see that." Dead Space 3 will be out for Xbox 360, PS3, and PC on February 5.